Mastering is the final stage in the process before your music tracks are ready for distribution. Whether it be for a CD or vinyl release, or just for digital streaming and download, Red Star Audio has the equipment and expertise to get the best sound possible from your audio mixes. Detail, clarity, depth and spaciousness are all enhanced and improved by the processing. We believe great mastering starts with great monitoring. That's why we use ATC SCM50A active loudspeakers with custom stands and acoustic isolation platforms. 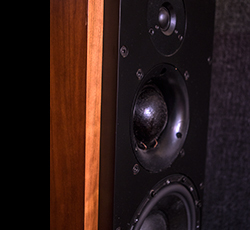 These industry leading monitors are truly incredible at reproducing audio accurately and with stunning dynamics. Our motto is that if it sounds great on ATC's... then it will sound great on everything else. 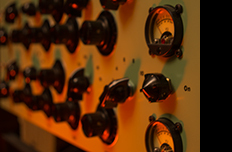 The main bulk of the mastering work is done by a pair of custom vintage Pultec-style valve EQs. Lovingly restored and rebuilt around a set of genuine 1960s EMI Redd47 pre amp modules and Mullard valves, these stereo EQs achieve results unlike anything else. Combined with other upgraded and modified vintage EQ's, compressors and limiters almost all mastering can be achieved in the analogue domain. For those rare moments when a mix is being overly stubborn, we have a huge range of UAD software plugins from Neve, Manley, SSL, API, Shadow Hills, Teletronix, Ampeg, Studer and many others which run inside our digital UA Apollo interfaces and can be surgically applied in realtime to the master or original mix. The best of both worlds whatever the solution. It is said the devil is in the detail. To compliment the hardware we have also paid great attention to the mains supply and cabling. Using techniques normally reserved for audiophiles, we have employed a mains isolation and regeneration system to ensure the lowest levels of unwanted noise possible interfering with the audio circuitry and a mains distribution unit supplying clean power to all the equipment. Cabling is ex-military surplus and was originally designed for wiring audio systems in military spy planes. It is that level of detail which we preserve in your music and capture in the master recording.